The House of Commons ordered the National Audit Office (NAO) to provide a report on the financial implications of decommissioning in the UK. “Oil and gas in the UK – offshore decommissioning” was released on the 24th January 2019 and the following is a summary of the current landscape. There are currently around 320 fixed installations, primarily in the North Sea, of which 100 are forecast to be removed from service over the next decade, alongside 5.7km of pipeline. The Oil & Gas Authority (OGA) has estimated the cost for operators to be around £58 billion and is now working alongside these companies to reduce their decommissioning costs by 35% in an attempt to lower the potential risks for UK tax receipts. This is being done in tandem with the goal to maximise the recovery of remaining UKCS resources. 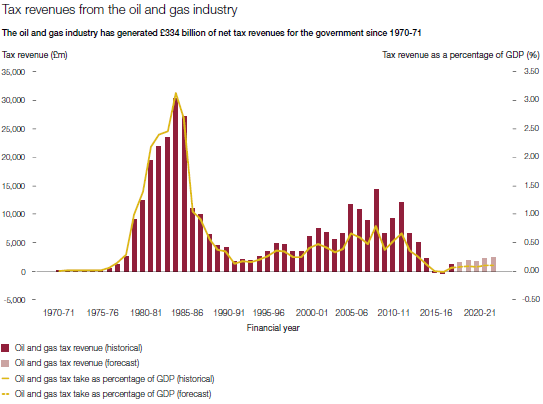 In an oil industry first, during the 2016-17 tax year, the UK government had to pay a net £290 million to oil and gas operators after the oil price decline hit operator profits and saw the lowest tax and license receipts since drilling’s emergence in 1970. This situation recovered in 2017-18 with a net receipt of £1.2 billion, which is expected to double by 2024 but the government are obviously wary of repeating the recent shortfall. The oil and gas sector has generated £334 billion of net tax revenues for the government and £4 billion in license fees since that time. At the peak in 1984-85 the sector accounted for 11% of the government’s tax receipts. For operators, the costs of decommissioning are another headwind, with the Department for Business and Energy requiring companies to set aside £844 million to soften the blow of future decommissioning costs. This has likely played a role in the exit of major producers from the North Sea over the last couple of years as large asset holders seek to lower future burdens. To combat the challenge ahead, Scotland’s North East has now become home to a National Decommissioning Centre (NDC) in the coastal village of Newburgh. Just as its villagers once sailed across the globe to deliver cargoes in the nineteenth century, they may see the same global demand for their growing expertise in other oil producing nations. The NDC has been tasked with helping the industry deliver the 35% cost reduction and is led by academics from the University of Aberdeen and OGTC. The organisation will serve as an R&D hub and will collaborate with other sectors facing the same challenge of aging maritime infrastructure. Despite the drive to reduce costs, operators have already begun spending £1 billion per year on decommissioning since 2014. With tens of billions still projected for the years ahead, it's easy to see why this sector has been on the radar of technical partners and the oil and gas workforce following the recent market downturn.